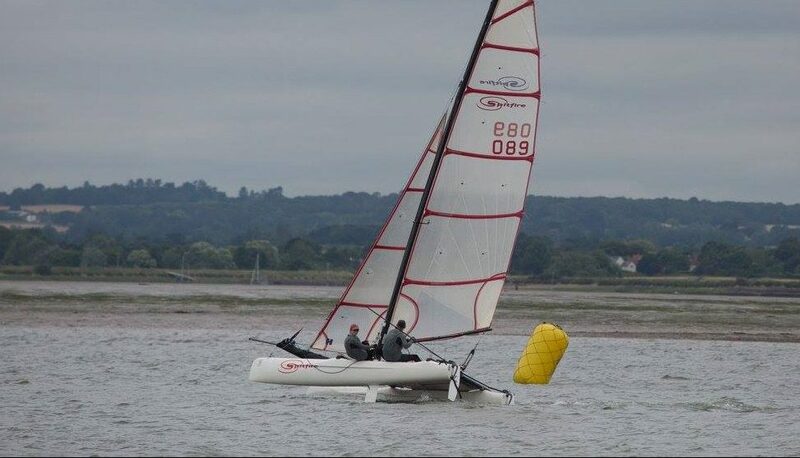 This year’s ECPR weekend lived up to expectations for exciting sailing , a great sociable atmosphere ashore and one of the best run events you could wish for. 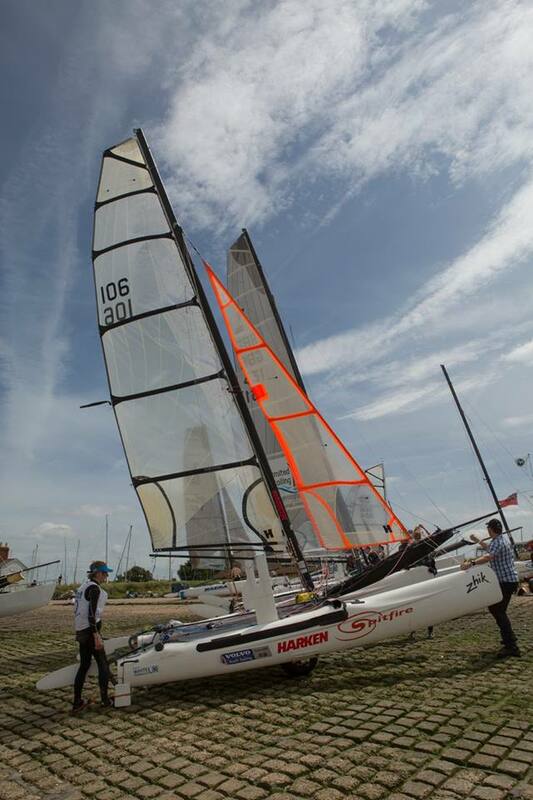 Saturday’s racing was in strong wind, but more significantly, large wind-over-tide chop. Sailing to the windward mark was challenging but possible, whilst bearing away to come back down wind was a different question. Ben and I managed a full stern over bows pitchpole and decided that was enough. Back onshore, watching others including Tornadoes do the same made us feel better! Molly and Matt survived well and Marcus/ Abby Wallace aborted launching as they watched our wipe out. 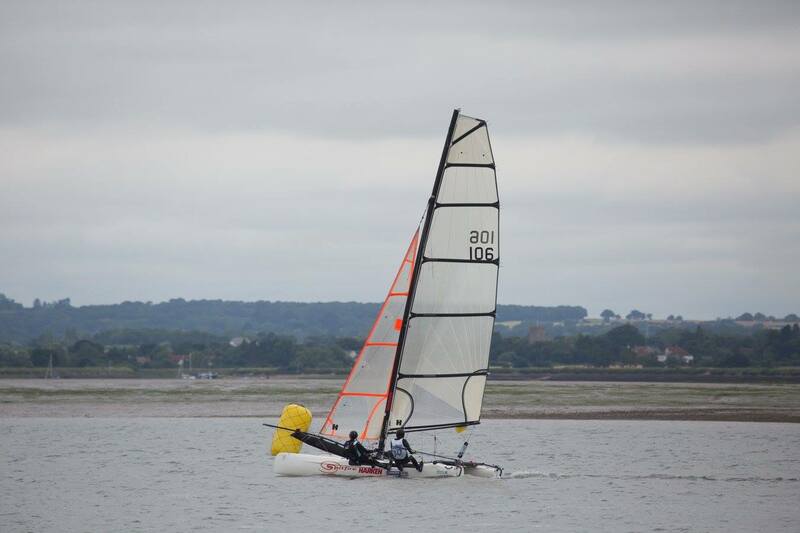 Grant and Megan did some scary foiling fly- pasts on the Nacra 20 and Kyle Stonenham in his Moth made the conditions look easy. Pete and John showed just how much boat preparation you can do in a day to get their pink beast ready for Sunday. The briefing featured an entertaining debate about how to hear the start cannons if Sunday was as windy as expected and the decision was announced that the furthest the full course would go would be Clacton, due to the forecast. After a BBQ and party night, Sweet Caroline at 6am felt really early and louder than normal, but it still didn’t wake Ben up. The wind for the start was quite a gentle force 3 but with both wind and tide taking you over the line, it was a question of when to turn downwind, hoist then accelerate to hit the line. We got it just right to a cheer from the Committee Boat! Molly and Matt chased hard and we changed places a couple of times on the way to Radio Caroline as the wind built for some fast sailing. A spot of twin wiring got us back up close to Bradwell to try to lay the mark further round the corner but in the end we had to drop and reach to the buoy. Once round, we thought about hoisting but quickly realised that a straight line white sail approach was best as Rob on the Shadow headed to West Mersea. Once away from the shore, the water got rougher and as we reached the mouth of the Colne, really quite lumpy so that keeping the speed up needed lots of work. Grant and Megan foiled the whole leg, which must have been an interesting ride. We rounded Colne with Molly/ Matt and Rob not far behind, only a Tornado in front. This was a one leg beat or at times a tight reach all the way back to Bradwell. The Tornado had to tack which let us catch them up, not realising that Kevin had fallen earlier and been injured. The beat back up the estuary was great, with stronger wind at times, helping us to pull out on the boats behind, really trying to catch the Tornado. The pink Nacra came past just before Stone going very fast and getting a large lead in the ECPR. 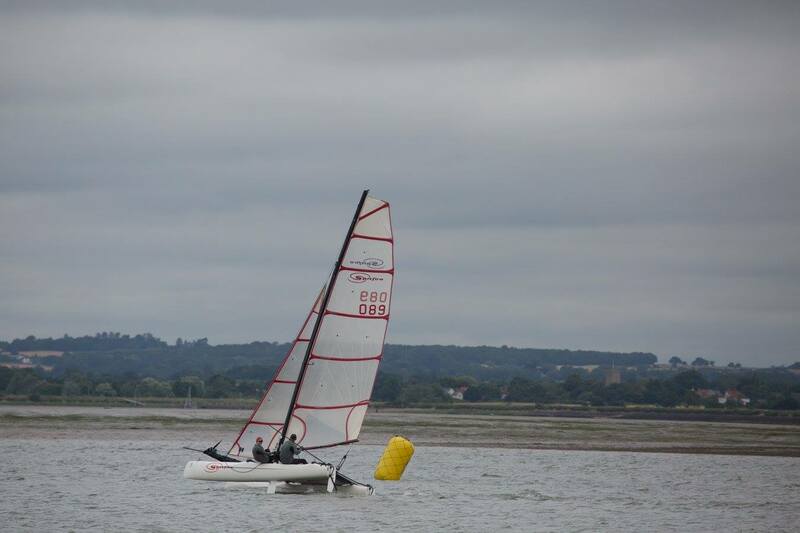 We were 2nd on the water in the Colne Point race, but were happy to break the course record set by a Moth last year. We did the 27 mile course (plus a bit of tacking) in 1 hr 54min, not bad for a Spitfire. The Tornado was just in front so the record now stands at 1h52m. It never ceases to amaze me just how good the Spitfire is for a simple, cheap 16 foot long boat. Well done to Molly and Matt as this is a challenging race- they won a massive silver cup for youngest team. It’s a very achievable challenge with excellent safety cover and perfect for Spitfires. Next year’s event will be on 2nd/ 3rd July and will be the 30th anniversary ECPR so an event not to be missed.